The scholarship winners are Keila Huacuja and Peter Tran of Edgewood High School, Jacob Gonzalez of International Polytechnic High School, and Megan Tran of West Covina High School. These scholarship awards are based on both the academic achievement and community service of the student. As Lions, our goal is to encourage and reward the volunteerism performed by students. Members of our Club strongly believe in higher education and eagerly encourage students to attend college. We believe that college provides a stimulating environment for broadening the academic and social knowledge base of youth. We also encourage students to continue their volunteer work in the community. Longtime West Covina Lions Beatriz Villagomez and Harry Shuster were named Melvin Jones Fellows at the District 4-L2 Luncheon on Sunday, February 26. 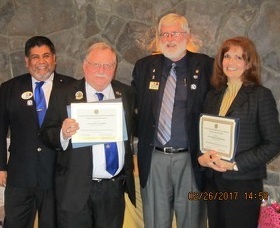 Pictured from left are District Governor Manny Sanchez, Lion Harry Shuster, PDG Roger Powell, and Lion Beatriz Villagomez. Our Club donated $1,000 on behalf of Bea Villagomez to the Lions Clubs International Foundation (LCIF). LCIF uses these funds for the many services and contributions it provides throughout the world. 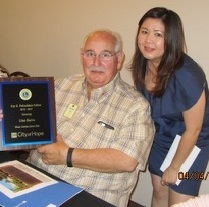 On behalf of the City of Hope, Cindy Trinn presented Lion Lino Barro with a beautiful plaque and thanked him for his 16 years of volunteer work. Through all those years, Lino met monthly with City of Hope’s Institution Review Board. Members of this Board are scientists and doctors who review current medical research. Lino’s assignment was to read thousands of pages of protocols to help determine if they are written in English that can be understood by the average person. In addition, Lino’s name has been added to the Kay Fukushima Wall in the City of Hope Rose Garden. During the time when Kay Fukushima was the Lions International President, Lino worked closely with him as an assistant. Sam is a black Labrador retriever puppy who was born May 11, 2015. 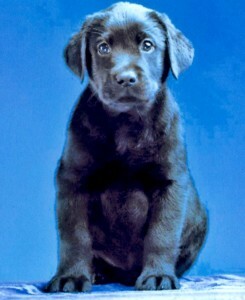 West Covina Lions are sponsoring this loveable puppy through Guide Dogs of the Desert. He was named Sam to honor one of our beloved past members, Sam Swartz. Guide dogs from Guide Dogs of the Desert change the lives of the blind by offering them safe mobility, loving companionship, and life-enhancing independence. Puppy Sam has been placed in a volunteer puppy raiser home to learn about the world and to form that important first bond with humans. He will spend the next 14-16 months being taught good manners, being socialized, and getting lots of love. During this time, the puppy raiser will take Sam to puppy training classes, puppy fun days, restaurants, on vacation, and if possible to work or school. Between age 20-24 months, Sam will return to the school for formal guide dog training. He will then undergo a variety of tests to determine his ability to perform the demanding work of a guide dog. These include heart, hip, shoulder, and elbow x-rays, an eye exam, and behavioral evaluations. If Sam does not meet the requirements to become a guide dog, there are several “change of career” options which Guide Dogs of the Desert will explore. The organization is now collaborating with organizations that train dogs for Medical Alert, PTSD, Autism, and Balance and Mobility Service. It began on February 5, 1965. I was 19 years old, attending Mt. San Antonio College. I had been accepted by UC Berkeley but had decided to attend junior college for financial reasons. I had not slept the weekend before because I had attended the Winter Nationals drag races and was working a graveyard shift on weekends, I awoke on February 5 with extremely bloodshot eyes and blurred vision. During the next week I lost all sight due to detached retinas. When I went to an ophthalmologist, he could not diagnose the condition and consulted the Jules Stein Eye Institute. Thereafter I was treated with large doses of prednisone and anti- inflammatory eye drops. I was diagnosed with Vogt Koinagi Haradas Syndrome (VKH or Haradas disease), which is a rare eye disease. I have only met one person with this condition. In addition to the detached retinas, my entire eyes were chronically inflamed. I had vertigo, white cells in my spinal fluid, and some of my hair turned white. After about six months of treatment, my vision returned to what I would characterized as high partial. I had a lot of scarring on the retina and vision acuity of about 20/80 to 100. However, the macula were not significantly damaged, so I was able to read with magnification. I continued my education in September 1965 and completed a Bachelor’s degree. I graduated from UCLA School of Law in 1971. That August I took the California bar examination. At that time, it was an essay only exam which lasted two and one-half days. I did not ask for any accommodations, but each session had questions printed on separate pages. On two of the days, I was almost unable to read the question because they were written on red and other dark-colored paper. Despite these problems I successfully completed the bar exam on my first try. After that, I worked for public interest and legal aid offices. My vision continued to decline. I litigated several civil rights cases including the Los Angeles County sterilization case, as well as numerous criminal jury trials. After reaching this point, my vision deteriorated slowly. Cataracts were developing as a result of chronic eye inflammation medications. In July and December 1975, I had cataract removal surgery. This improved my vision again. In May 1979, I decided to enter private practice. My eyesight continued to deteriorate, despite my continuing use of steroids, anti- inflammatory eye drops, and eye drops to control glaucoma, which had developed due to the chronic eye inflammation and the medications. 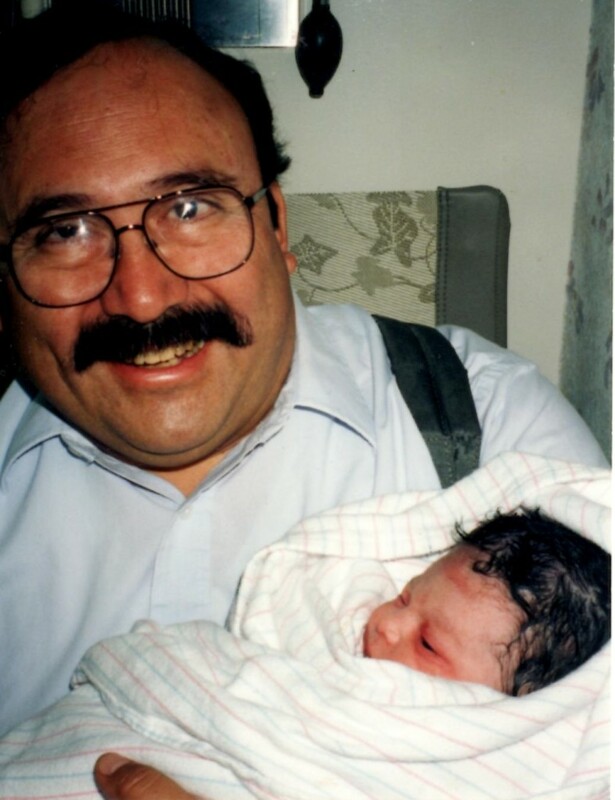 In 1983, I finally admitted to myself that I was visually impaired and might go blind. I joined the California Council of the Blind (CCB) Foothill chapter. Because I could no longer read with magnification devices, I purchased closed caption TV equipment, using the Braille Institute partial funding program. My practice was mainly Workers Compensation claims and car accident personal injury cases. I stopped doing criminal trials because I was no longer able to select jury members effectively due to my vision loss. In 1984, I underwent surgery on both eyes in an attempt to control the eye pressures. This surgery was somewhat successful, but my vision continued to worsen. Private practice became harder because of vision loss and the challenges of negotiating a satisfactory settlement for my clients when an adverse attorney learned of my visual impairment. By the late 1980’s, the stress of private practice forced me to change careers. Beginning in about 1986, I started to look into state or government employment. I was appointed an Administrative Law Judge (ALJ) for the California Unemployment Insurance Appeals Board (CUIAB) on August 31, 1990. In 1991, my vision deteriorated to the point that I was no longer able to use a CCTV effectively. An assistant was hired to read me files and assist me in hearings. I began using a computer with a speech reading program, an OCR program, and a scanner. By the late 1990’s, I had lost usable vision. With the improvement of the internet, the legal resources I needed for my job were online. I am able to judge the credibility of witnesses well because research has established that speech and voice changes in a person’s speech pattern are better guides to determining credibility than facial expressions. In addition, I asked the witnesses questions. If I doubted the truthfulness of the testimony, I asked more questions. Effective examination is a good way to establish the credibility of a witness testimony. The ALJ who trained me believed that I would develop into one of the best ALJ’s in CUIAB, and I am generally considered to be a very good ALJ. During the time I was losing sight I experienced a high level of stress. Since I have become blind, that stress has mostly gone away. I feel that I can live a contented and happy life albeit a different life.